In today’s education environment, it is almost impossible to avoid hearing the word “collaboration.” Not only is collaboration an important 21st century college and career readiness skill, but for many students, face-to-face communication is slowly being replaced by screen time, causing an even greater skills deficit. 1. “The Horseshoe” – The horseshoe is a great strategy for whole class activists, such as round-robin reading, or group discussions. The “U” shape allows students to make eye-contact and converse with anyone in the class, and still gives the teacher the ability to guide the conversation. The Crescent and Huddle series desks by Smith System and the Apex Trapezoid desks by Marco work well with this configuration as shown below. 2. “4 Square” – The unique shape options available for collaborative desks means that you can easily push four together to create a table. Tables of 4 are great for group work, as it is small enough to encourage equal participation, while opening up a space for multiple opinions on any given topic or task. The Koi Collaborative Desk by Paragon features a unique fish shape desk top, which can be arranged in several configurations, including the “4 Square”. The optional casters (wheels) gives you the flexibility to frequently rearrange the desks into the different configurations that best fit the needs of the lesson. Other desk options for the “4 square” configuration include the Apex Bone Desk by Marco, Wing Desk by Smith System and the ZBoom Modular Desk by Virco. 3. “Collaborative Pairs” – Most teachers today have heard of Think-Pair-Share as a learning strategy, but moving students or deciding who will pair with who drains valuable class time. 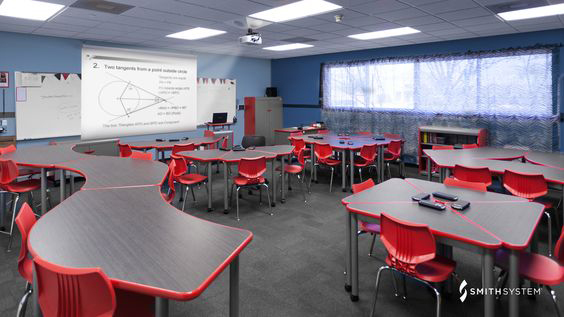 Collaborative desks fit seamlessly together in twos for quick and easy partner activities. 4. 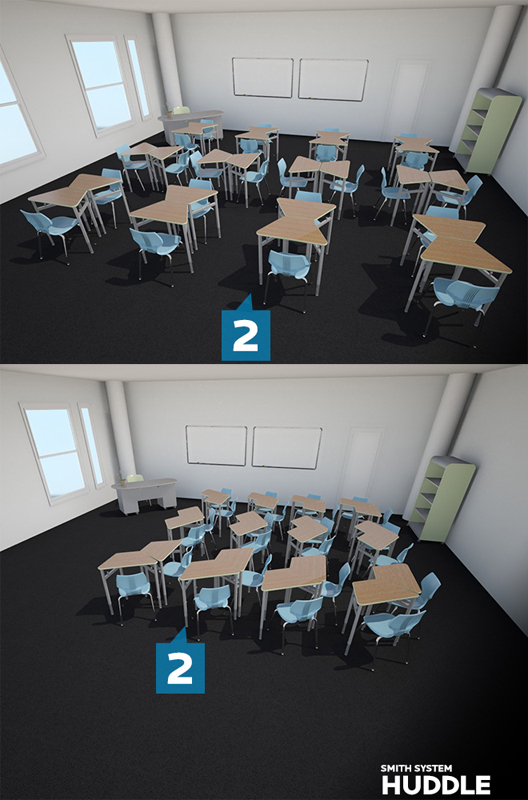 “Station Rotations” – By joining larger numbers of desks together, teachers can create station rotations. Collaborative desks form large tables, and each table is assigned a different task. This incorporates both collaboration and movement as students rotate to different tables to complete various learning activities. 5. “Classic Lecture” – One of the greatest conveniences collaborative desks is the ability to separate students when needed. The one time you do not want students to collaborate is on a test or quiz! Collaborative desks offer a wide-range of collaboration strategies, as seen above, but unlike tables, can be broken apart for independent assessment. < Free Cover with Bye-Bye Buggy Purchase!